My first visit to South America was in 1997. 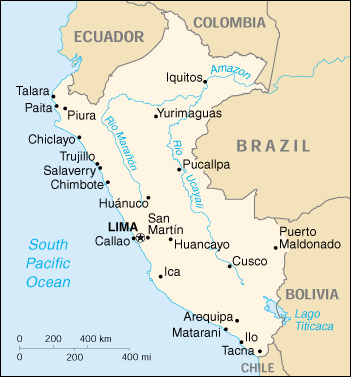 I spent two weeks in Perú in March, 1997. One week was in the Amazon rain forest near Iquitos. This included a trip up the Amazon about 100 km (60 miles) to a Jungle Lodge where I stayed 3 days and had some nature walks and trips on boats, including one at night. I saw a lot of wildlife. The tracker was fantastic. He could spot camouflaged animals in the jungle 100 m (330 ft) away. We saw parakeets, the big Macaw parrots, monkeys, sloths, iguanas, and lots of birds. The Amazon river is impressive. 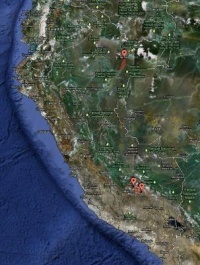 It is at times more than a couple of kilometers wide. We saw some river dolphins. They are essentially blind, since the river is usually too muddy to see anything. They navigate mostly by echo location. At the time of this vacation I didn't have a good camera, just a fixed focal length small 35 mm, so I don't have pictures of all these animals. The second week I spent in the Andes at Cusco. Sightseeing around Cusco brought me to various Inca temple sites and other remnants of this ancient culture. Cusco is a UNESCO World Heritage Site. The highlight of that part of my trip was the excursion to Machu Picchu by train. The train ride is very scenic through some wild gorges. The trip up to Machu Picchu is by bus. Machu Picchu is really impressive. 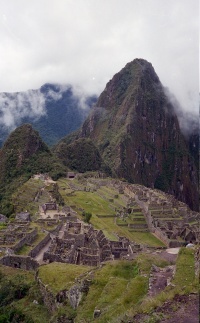 Machu Picchu is also a UNESCO World Heritage Site. I stayed at Machu Picchu for one night. My hotel was in the valley. There is a hotel on the mountain. If you plan to stay at Machu Picchu, you should definitely try to get a room at the hotel on the mountain. On the second day I walked down from the mountain. It was a very scenic walk of maybe 1 ½ hours, with lots of interesting plants to see, including many orchids. Addendum: Since this first visit to South America I have visited many countries in South America.